Looking for a great way to explore our winter wonderland? The Ludington State Park offers free guided snowshoe walks on Saturdays in January and February, weather permitting--so think snow! These one and a half hour guided programs are from 2-3:30pm or 6-7:30pm and will take you past some of the most beautiful State Park scenery, through woods and snow-covered sand dunes. Lantern Lit Ski and Snowshoeing Events (January 5 & 19; February 2 & 16) from 6-8pm, Guided Snowshoe Walks (January 5-February 16 at 2pm...January 12 & 26; February 9 at 6pm. Visitors can bring their cross country skis and/or snowshoes to ski or walk a lighted groomed trail through the Ludington State Park's snow-covered forested sand dunes. The trail starts from the Warming Shelter. Bring a flashlight or headlamp! You can borrow one of the park's 60 snowshoes, but there are no cross country skis to loan out. No reservations are needed. The park also offers winter camping and heated mini cabins are available for rent. Tired of skiing or just want to try something different? 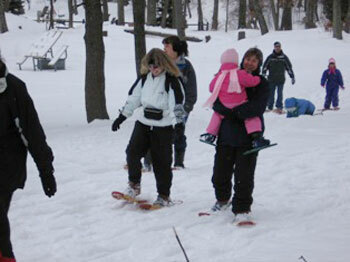 Come out to experience for yourself the fun and benefit of walking in snowshoes! Your guide will teach you how easy it is to put on and use this winter-friendly footwear. Snowshoeing can burn up to 750 calories in one hour of moderate walking! It's also one of the safest winter activities around and can be enjoyed by anyone at any age. All walks begin and end at the Warming Shelter, located next to the parking lot at the park's entrance. The park loans out 60 pairs of snowshoes on a first-come, first-serve basis, so you may want to arrive a bit early if you plan to borrow a pair for the hike. These snowshoes will fit people of all ages, from age 10 and up. If you have your own snowshoes, bring them along--and invite a friend to enjoy the walk with you! Dress warm in layers, and wear good fitting winter walking shoes or boots. Bring a flashlight if you're going to attend the Moonlight Walk. Free warm beverages are available at the Amphitheater's bonfire...and there will also be a bonfire at the warming shelter. The guided snowshoe walks are free and no reservations are required. 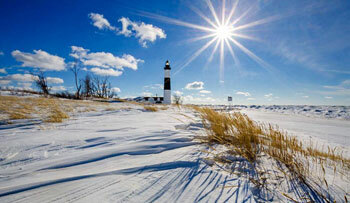 However, a Michigan State Park Recreation Passport is required to enter the park and may be purchased at the park. Residents may also now purchase the $10 Recreation Passport when they renew their Michigan license plate at the Secretary of State office or through the Michigan e-store at www.michigan.gov/estore.